This link will be handled as a field within the form application. We have to set the field name, data type, label and define if we will use a specific connection for this link. If decide to you use a specific connection there will be a combo box with for you to seleact according to the connections available in the project. Creating field to update link table. In this step you need to inform the data source, this connection will be available for the user to select (lookup). It allows you to choose if the select command is manually informed or if it will be based on a table. 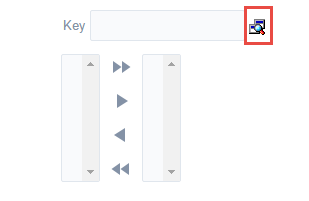 If you check the option “Choose table” there will be 3 combo boxes for you to select according to the connections tables available in the project: table, key field and description. Informing the select command based in a table..
Key : Value that will be stored in the table. Description : Value that will be displayed in the update field. Select command informed by user or created based on a table, it is responsible for displaying the selection field contents. Display key and description : If you want to display the code and the description informed in the select command. Display Title : Displays attribute title (see attribute). Separator : When the option Display key and description is checked as yes you must define a separator between the code and the description. Object : Object field type that will be displayed in the update form. The types are: Select, Radio, Check box and Double Select. Check and Uncheck All : Option to Check and Uncheck all records (available only for when Check box object is selected). Height : This option sets the object height (available only when the objects Select or Double Select is selected). This option sets the relationship table that will be updated. This option sets the application fields that are related with the link table fields. Setting values for the fields in the update table. This option sets the field from the lookup table that is related to the link table. Defining the foreign key relationship table.. This option sets the values that are recorded in the fields of the link table that are not foreign key. Attributes : It is written a value without the need for user data entry, it is an application field itself. Data entry : It is written a value reported by the user, it is necessary to create a field and relate it by the select. Search in the double select field. This option sets a filter for the link field.
! [Search settings for the link field. ][relacao_n_n_info_filtro_config] Search settings for the link field. Limit of Records : Maximum number of records returned by the search. Initial State : this option sets whether the form field load come Filled or empty. Search Fields : This option sets whether the search will be displayed the code and/or Description. This option allows you to configure all general display settings from from field title and object. This feature allows it to be documented instructions for use of the application generated, that is, help end users to better understand the business rules of the system and the best way to operate it. Help Description : This option allows the inclusion of a text that will be displayed when the user to position the mouse over the field. Popup : When choosing the type popup, help icon is displayed next to the field; that when clicked, will display what was reported in the attribute Describes Help. Hint : When you pass the mouse cursor over the field, will help described in the field Describe Help. Text : Next to the field will appear a text containing the help that was described in the field Describe Help.